Dow Water & Process Solutions (DWPS), a business unit of The Dow Chemical Company, is planning to tap the power sector for its recently launched wastewater management technologgy, Fortilife. “Currently, we are focusing on textiles (where we have done significant amount of work with this technology). Going forward, we are now looking at power, which is one of the big segment that has to adhere to stringent wastewater treatment norms. Eventually, we plan to move into other sectors,” said Sharad Gollerkeri, regional commercial manager, water & process solutions, Dow Chemical International Pvt Ltd (Dow India). "With Fortilife, which enables minimum liquid discharge (MLD), Dow Water & Process Solutions aims to tap water intensive industries such as textile, power, etc"
DWPS developed Fortilife as a solution to solve the challenge of effluent discharge faced by the textile mills in Tiruppur, Tamil Nadu. Fortilife, which enables minimum liquid discharge (MLD), helped these textile mills to comply with regulation by minimising environmental impact and also reducing their operating costs. Now, the company wants to target other water intensive industries with this new technology. “We see significant economic benefits for our customers with Fortilife. We started with textile industry and are now targeting the power sector and other water-intensive industries where wastewater recycling is needed,” added Gollerkeri. India is facing severe water shortage challenge, with per capita availability going down continuously, forcing the government to put in place stringent effluent treatment norms for industrial users. 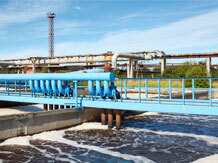 This has propelled the demand for wastewater treatment technologies in the country. “We see great potential in India as there are unmet needs across multiple industries for wastewater treatment applications. The government has also brought in policies which are crucial for the growth of water treatment industry. We are bringing to the market a range of innovative products, which are specifically designed to meet the requirements of Indian customers,” said Yochai Gafni, global business director (reverse osmosis), The Dow Chemical Company. Many industries are also seeing economic benefits of incorporating eco-friendly technologies as they realise that wastewater can be their low-cost and most reliable source of water. “With the government enforcing environmental laws stringently, companies are compelled to embrace technology that help them adhere to the prescribed rules of discharge. While this (regulator compliance) is driving the wastewater treatment technology market, many companies are also looking to bring down their manufacturing cost by adopting solutions, offered by companies like Dow, to use recycled water in their facilities. That (economic benefits) will be the real driver for the adoption of wastewater treatment solutions in the future,” stated Alan Chan, commercial director, Pacific, Dow Water & Process Solutions. Description: Read more about Dow eyes power plants for new wastewater treatment technology in India on Business Standard. With Fortilife, which enables minimum liquid discharge (MLD), Dow Water & Process Solutions aims to tap water intensive industries such as textile, power, etc"
1 Response to "Dow eyes power plants for new wastewater treatment technology in India"